I love cornbread. It's the perfect accompaniment to summer BBQs, a bowl of chili or a Thanksgiving feast. 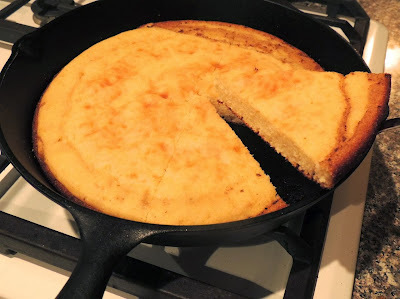 I was super excited when I saw a recipe for Buttermilk Skillet Cornbread in the November issue of Sunset magazine. It was perfect timing too because I happened to have some buttermilk in the refrigerator that I needed to use up. Yup, it was the recipe for a delicious dinner. I followed the recipe exactly except I used white cornmeal instead of the suggested red, blue or yellow cornmeal since I happened to have white cornmeal on hand. Typically, I'd probably use the traditional yellow cornmeal. When given the option of type of flour to use, I chose All Purpose flour since I didn't have any white whole wheat flour on hand. Also, when given the option of using sugar or honey, I chose honey. It just seemed like honey belonged in this cornbread. The recipe was super easy to make, and it turned out just like the picture in the magazine. I was impressed with the large serving size and that each serving only had 210 calories. Really, one serving is all you need! Tonight, we ate the cornbread with boneless BBQ ribs and my Everyday Salad. It tasted like Indian summer. Living in Los Angeles, that's pretty much how this 80+ degree day in November felt. The cornbread tasted delicious right out of the pan, but it's even better topped with a little spray butter or a drizzle of honey. I'm sure it'd also be perfect for sopping up chili or extra BBQ sauce. It has a nice fluffy texture, but it wasn't too dense. Really, I couldn't ask for a better, easier recipe. 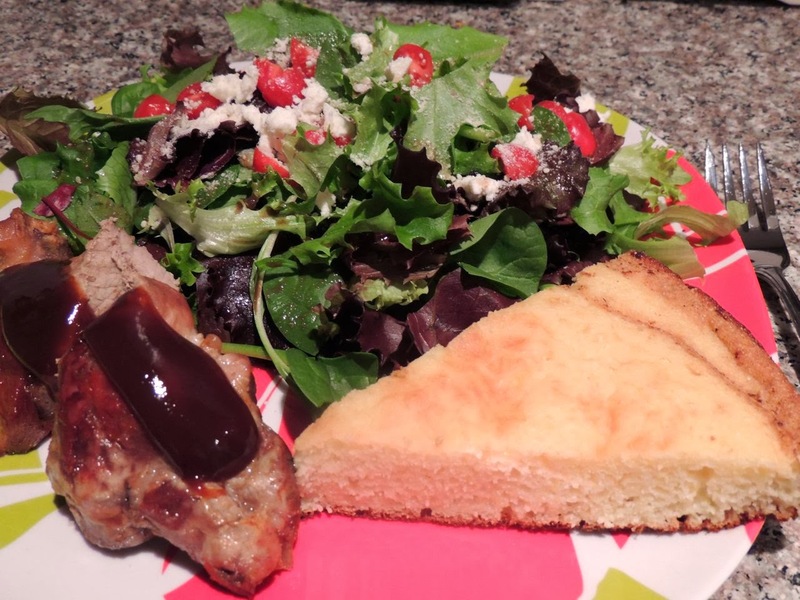 I'm definitely adding this recipe to my "do again" list; this cornbread would be perfect for Thanksgiving dinner! Whisk dry ingredients in a large bowl and mix eggs, sugar, and buttermilk in another bowl. Remove pan from oven and brush butter over the inside. Whisk wet into dry ingredients, pour in melted butter from pan, and whisk until batter is smooth. Pour batter into hot pan and bake until lightly browned and springy to the touch, 25 to 30 minutes.